Home estrogen , FSH , Hormones , progesterone Order Your Own Lab Tests! Can't find a doctor to order your hormone tests, beta, etc? There is an online site that offers to help you out! NOTE: Due to state billing laws, PrivateMD Labs cannot provide services in NY, NJ, MA, MD or RI. Private MD Lab Services delivers state-of-the art lab procedures directly to the public - confidentially, conveniently, and affordably - complete with a physician's order and no hidden fees. Questions on how to order? Click here to get started or call us toll-free at 1-877-283-7882. Our certified professionals are standing by to assist you. Once your order has been processed, you will receive an email confirming your order has been processed and a secure email with your lab requisition papers. After printing your lab requisition papers, which is your physician's order, you may proceed to the Patient Service Center of your choice for specimen collection. No appointment is necessary. Once your lab tests are complete (usually within 24 hours after collection), Private MD Lab Services will notify you via email that your lab results are ready to view and provide you with a secure link to view and/or download your results. The page for Female Specific Tests offers a Qualitative Beta (yes/no) (HCG) at $49.00. 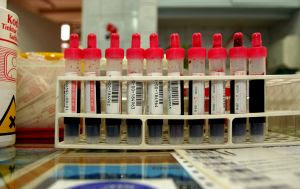 They even offer a Lab Locator, so you can find a lab near you to go get your blood work done.